Alexandria Housing Development Corporation (AHDC) understands that housing is a fundamental part of promoting Alexandria’s community health. Our goal is to make sure that our residents not only have quality and affordable housing options, but that our properties afford access to and build capacity for wellness in the City. We’ll be talking about AHDC’s commitment to community wellness in the next few weeks, both where we are now and where are going. Additionally, Americans don’t consume enough fruits and vegetables. The CDC reports that in Virginia, 22.2% of adults have less than one serving of vegetables/day, and 38.4 have less than one serving of fruit/day. Decreasing these percentages will result in greater community health outcomes. The City of Alexandria is better equipped to handle these issues than most. We have an abundance of groceries within our borders, and access to locally grown and fresh foods via farmer’s markets promotes healthy and green consumption. People can thrive here – if they can afford to live here. With 90% of market affordable units from 2000 now gone, this is more of a challenge with every passing year. 1. Budget saving affordable rent - Because AHDC is exclusively focused on affordable housing within city limits, more low-to-moderate income residents have the chance to live local and reap the health benefits of Alexandria, without sacrificing their paycheck. Every dollar not spent on rent can be spent on fresh fruit, vegetables, dairy and whole grains for adults and children alike. 2. Geographically Close to Supermarkets - Every AHDC property is located under approximately half a mile from a grocery store – a mere few minutes by car, and a walkable distance on foot. Alexandria enjoys a higher than average grocery store count per 1,000 residents, and AHDC makes that geographic benefit available to those who might otherwise be pushed out of the city. 3. Urban Agriculture and Education - We use our designed spaces to promote urban agriculture that benefits our residents. 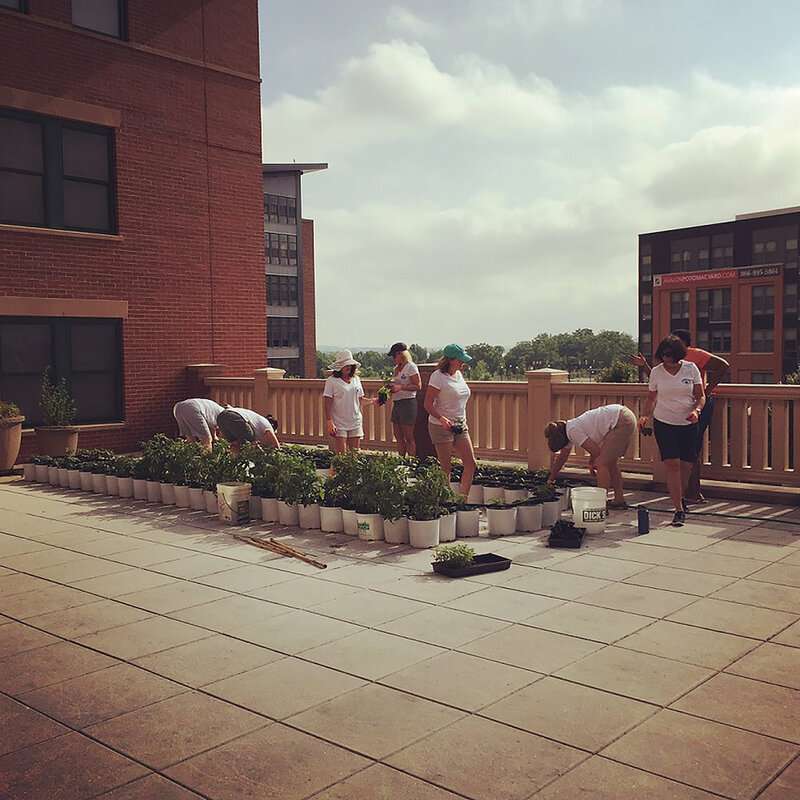 At the Station at Potomac Yard, we partnered with Rooftop Roots to build an innovative urban rooftop garden which benefits AHDC residents. In our upcoming Carpenter’s Shelter renovation project, a 1,600 square foot production garden will likewise provide education and supplemental nutrition to future AHDC and Carpenter’s Shelter residents. We envision a diverse Alexandria where all people can live and thrive. We support environmentally friendly housing solutions, people oriented design, and community wellness both within our properties and in Alexandria at large. Learn more at housingalexandria.org. “Access to Affordable and Nutritious Food: Measuring and Understanding Food Deserts and Their Consequences.” USDA, 2009. Older PostWho lives in Affordable Housing?